What do the Falaknuma Palace and the Mercedes Benz S-Class have in common. Well, opulence of course! Here’s a closer look at both in their current forms. Falaknuma, literally, means a reflection of the sky, which seems to hold true for the magnificent palace that was our destination in Hyderabad, for it indeed was built to be a reflection of the heavens. Built in the 1890’s, the palace was the royal residence of the sixth Nizam of Hyderabad, who was reportedly at that time, the richest man in the world. Incidentally, this image conforms perfectly to our drive in the facelifted S-Class, for the S is clearly regarded as the top cloud of luxury cars. Mercedes claims that the S-Class ‘is the best car in the world.’ Well, regardless of whether you agree or not, the fact remains that, for a very long time now, the S-Class has remained the benchmark and the sales leader in its segment across the world. Even from a social perspective, driving an S-Class is clearly perceived to be a stamp of your success in life. It’s true that part of this credit goes to the blue-chip brand value of the three-pointed star. Still, we must remember that for most successful individuals, and even heads of state in many cases, the S-Class remains the gold standard when it comes to choosing a set of wheels. The new car, then, clearly has big shoes to fill – and, as far as its design is concerned, it fills them quite well. It features minor changes to its front and rear design with new bumpers, a bigger grille and slightly tweaked headlamps. There wasn’t much to do in any case, for the outgoing S-Class still looks quite fresh. But the minor changes that have been undertaken work very well indeed. The bigger grille and extra chrome work on the front give the car decent road presence, and the face that it’s over 5.2-metres in length only adds to this presence. An interesting design highlight on the car is the rather sharp character line that runs from the front fender till the rear door – it’s quite sharply defined and looks pretty good. A quick look at the interior of the new S-Class is enough to make you believe that no other car in its segment can top its opulence and design. With Mercedes’ reinvented design, superlative fit-and-finish and massive advances in the multimedia and features department, the interior is a true delight to spend time in. Pair that with the mood lighting, huge dual-digital displays that make up the centre console and driver’s instruments, and the S-Class’s interior is a brilliant place to lose yourself in for many hours at a stretch. The isolation from outside noises is also quite superb. With excellent seats, it’s a great car to be chauffeured in too of course – even more so now with the new massage function in the rear seats, which, to put it mildly, is amazing! The rear passenger, then – with the space, comfort, isolation from the outside world and excellent massage functions – truly gets treated like royalty. And this otherworldly experience of riding in the S-Class is further aided by the excellent 13-speaker Burmester sound system that offers sensational sound quality. On the mechanical side – which, let’s be honest, not many owners worry about – the S-Class in regular trim is offered with a 3-litre diesel in the S 350d and a 3-litre turbocharged petrol in the S 450. We drove the S 350d, which offered excellent refinement. Heralding a new era in the Indian market, both the engines on the S-Class already conform to Bharat VI emission standards and are capable of achieving them even on the relatively lower quality fuel currently available in the Indian market – which indeed is quite a technological feat. The engine delivered power as smoothly as one would expect. The big change here is the new nine-speed transmission that now works perfectly fluidly and offers seamless shifts. Despite offering ‘only’ 282bhp in the diesel version, the S has more than enough poke for our roads – especially considering that the car will be chauffeur driven for a vast majority of the time. The ride comfort from the AIRMATIC air suspension, meanwhile, is quite sensational and deals with our roads like a magic carpet in comfort mode. You could switch to Sport mode to tighten the suspension and throttle response, but that just sounds silly for a car like the S – especially on our roads. The other highlight on the new S is the bevy of safety features that it comes fitted with. 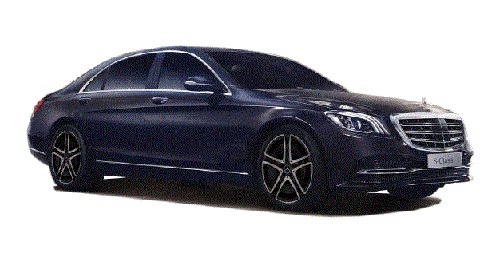 With nine airbags, active steering assist – helping the driver to keep the car in its lane – active blind spot assist and many other very wisely thought through features, the S-Class is virtually like a fortress on wheels. It even has active safety systems to try and prevent pedestrians and cyclists in urban conditions from colliding with the car. However, given the chaos that prevails on our roads, a lot of these systems are still too advanced to be of any practical use in our country. What’s certain, though, with the new S, and its refinement, build quality and features, is that Mercedes has laid down the gauntlet yet again in the luxury segment. The brand new Audi A8 will be out this year, but it’ll have its work cut out for it if it truly wants to challenge the S.
Just one final point – if you’re thinking of buying one, I should mention that prices for this level of luxury don’t come cheap. The car starts at Rs. 1.33 crore. Who said being on top of the world is cheap?